• Attend New Student Orientation: join the RU-N Family! The Honors Living-Learning Community (HLLC) is a transformative college access and success program that fosters the academic, social, and personal development of talented first-year and transfer students with a desire to make a difference in their communities and beyond. HLLC offers a residential scholarship that covers room and board. 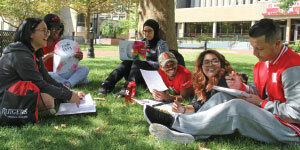 The Rutgers University–Newark Talent and Opportunity Pathways program (RU-N to the TOP) is a financial aid program that provides a “last-dollar” scholarship covering the cost of in-state tuition and mandatory school fees after all federal, state, and internal/external scholarships and grants have been applied. 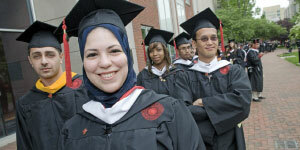 For more details and eligibility requirements, visit admissions.newark.rutgers.edu/paying-for-college/ru-n-top. The Phi Theta Kappa Scholarship was created for students who are attending a New Jersey community college and are members of Phi Theta Kappa Honor Society. Visit ptk.org. 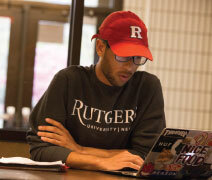 Rutgers University–Newark (RU-N), an anchor educational institution in and of New Jersey’s largest city, is a leader in research and scholarship, fostering excellence at the intersection of academic and civic engagement. With an enrollment of more than 12,400 students from 119 countries, its undergraduate, graduate, professional, and joint-degree programs span more than 100 areas of study. RU-N champions people from all walks of life to succeed and lead in our learning community. Our students benefit from small class sizes, funded research opportunities, and inspiring internships with local businesses and Fortune 500 companies. With undergraduate majors offered across the liberal arts, business, criminal justice, public service, technology, health professions, life sciences, and media arts, students have ample choice to pursue their academic interests. Our students work side-by-side with our award-winning faculty, putting theories and ideas to the test. Our graduates are prepared to steer social and economic change on a local and global scale. Transfer to RU-N and transform your future. Diversity enhances an exchange of ideas, innovation, learning, teaching, and community engagement—an everyday occurrence at RU-N, which long has been recognized as one of America’s most diverse universities. Our students and faculty represent an inclusive cultural environment that inspires academic scholarship, fields of study, local and global social justice, advocacy, and community well-being. We leverage diversity to ignite imaginations, generate opinions, encourage civic dialogue, and empower world changemakers. We challenge our RU-N community to intentionally build upon our legacy as a place of opportunity for everyone. RU-N is a place where difference has a human face found in the many personal paths, passions, and possibilities that converge here. We invite you to join us in this intellectually and socially stimulating community that values diversity for everyone—every day! You will feel right at home on our diverse and welcoming campus. Whether you live on campus or commute here, there are plenty of ways to get involved and have fun as a student at RU-N. Plus, New York City is just a 20-minute train ride away. As a RU-N student, you’re not only part of an active student community but part of one of America’s largest urban college towns. Rutgers University–Newark channels the global citizen in you to learn and make a difference through cultural exploration. RU-N’s commitment to academic excellence allows students to benefit from study abroad programs that support a variety of interests and provide key experiential and service learning opportunities. We understand students are active members of the global community and seek out ways to explore the world, make lasting memories, try new things, and have fun. Our RU-N faculty design an educational adventure that our students remember for the rest of their lives. We encourage aspiring CEOs, doctors, lawyers, artists, activists, scientists, educators, and all students to maximize their undergraduate experience and take us up on this once-in-a-lifetime educational journey.